Tackling all aspects of Web design theory, including the ways that color, fonts, clip art, photographs and so on contribute to creating a visual impression, this book is for any course in Web Design, Graphic Design, Web Graphics, Advertising Design or Visual Communications. It takes the students through site planning and layout and others. With Robin Williams' guiding hand, non-professionals, artists, and designers alike have learned the principles behind elegant design. 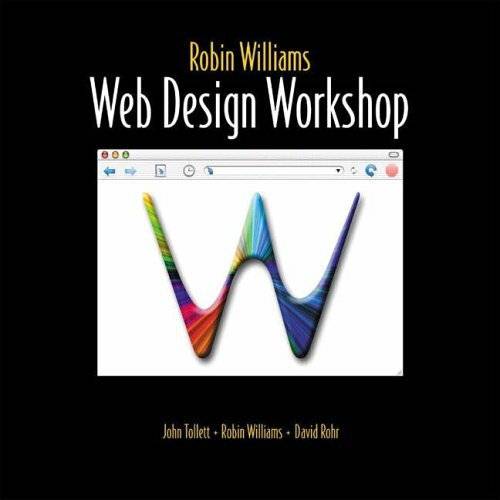 Now that much of this same audience is working on the Web, Robin has focused her attention on the specific needs of this medium with Robin Williams Web Design Workshop. John Tollett and Dave Rohr pitch in with their illustration and graphics experience to create a handsome and engaging instructional book. The ideas in this book tackle all aspects of Web design theory, including all the ways that color, fonts, clip art, photographs and so on contribute to creating a visual impression. Then the book takes the user through site planning and layout, navigability, and functionality, all in Robin Williams' clear and accessible style.